This isn’t entirely stand up paddling news, but I thought it was pretty cool all the same: Prone paddleboarding is part of the 2015 CrossFit Games, which are happening right now in LA. Wanna know how/why a 12’6 looks like a 12’6? Then check out this great clip featuring SUP ATX/Lahui Kai head shaper Brian Szymanski. One of the most respected paddleboard shapers in the world, Brian Szymanski has joined the SUP ATX team to further develop their Lahui Kai race board range. 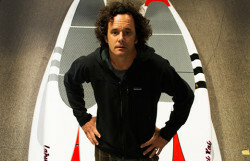 California SUP pioneer John Becker joins the team along with Brian, in what is a major coup for the brand.